The graph of binding energy per nucleon (Hyperphysics) seems to peak at Iron-56. However, Wikipedia says that Nickel-62 has the highest binding energy per nucleon of any known nuclide (8.7945 MeV). Isn't this a direct contradiction? Why does the binding energy per nucleon peak at Iron-56, but then Wikipedia says Nickel-62 has the highest binding energy per nucleon? User Mithoron makes a good point that it depends on how the Y-axis of the plot is taken. 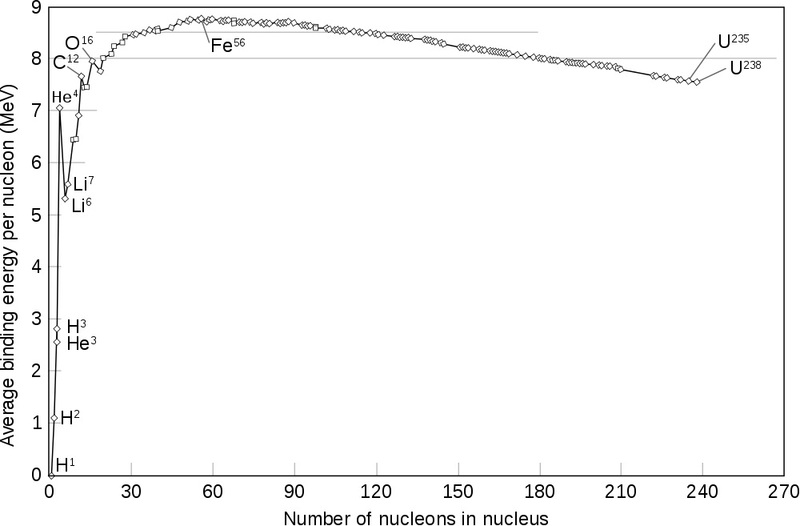 You can plot average mass per nucleon in which case iron-56 is the heaviest atom per nucleon. 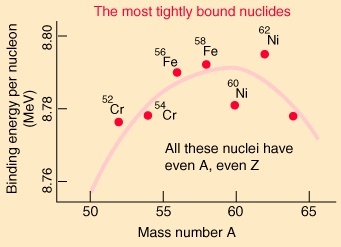 However if you plot binding energy per nucleon, then nickel-62 has the highest binding energy per nucleon. For elements with stable isotopes I'd guess only the stable ones are shown. For elements with unstable isotopes than some selection process is necessary so as not to clutter up the plot too much. I'll point out that the "peak" is marked as "Iron Group." It isn't entirely clear what isotopes that means. Wikipedia notes that in astrophysics The iron group in astrophysics is the group of elements from chromium to nickel which are substantially more abundant in the universe than those that come after them – or immediately before them – in order of atomic number. In terms of stellar production much more iron than nickel is produced. The iron produced in stars is about about 92 % iron-56. Nickel is only about 3.6% Nickel-62. I'd guess that the plot is a "best fit line." Here is a different plot showing more detail. You can see that not all isotopes fall on "the line." Here is another plot at link pointed out by user IanBush in a comment. The "best fit" curve doesn't pass through all the data points. Not the answer you're looking for? Browse other questions tagged isotope nuclear-chemistry or ask your own question. How come uranium's relative atomic mass is 238.03 when it only contains isotopes with a mass number of 238 or less? What is the formula for finding the average atomic mass of an element based on the abundance of its isotopes? Where does the molar mass difference between N₂ and CO come from? How to find the relative abundances of isotopes of an unknown element? Is the relative natural abundance of isotopes of an element the same everywhere? Is iron the most stable element in the periodic table? Burning different isotope combinations of hydrogen and oxygen, how much does the energy vary?